It was the Monday before Thanksgiving. I had made the choice to move from Portland to San Francisco right after Labor Day, to start a new chapter of my life. It didn’t take long to become acquainted with people at work, at my new church, and through the local Glen Park Homeowners’ Association. Part 1 contained information about how to find your contractor. Now we’re going to discuss what happens next. 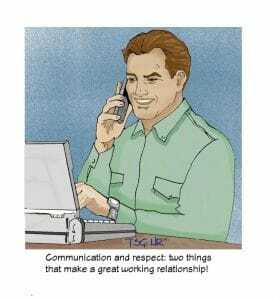 Meetings with contractors should include the major decision-maker(s) when the appointments are scheduled, because communication, compatibility and respect are important parts of the working relationship. 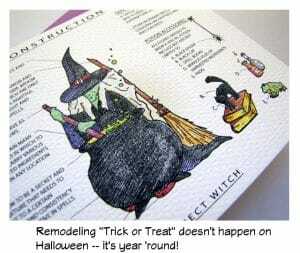 Remodeling Horror Story: Trick Or Treat? A D-I-Y basement renovation that got out of hand. A master bathroom project that was totally bungled by a designer who acted as the general contractor. A D-I-Y master bedroom expansion into an adjoining bedroom; taking out a bearing wall is a NO-NO! A bad deck replacement done by an unlicensed contractor that left the Homeowners with no legal recourse. A new home that had all of the hot and cold lines swapped by the plumber. A D-I-Y floor refinishing project that ended up with the floor being replaced after the sanding drum was installed backwards, chewing up the floor. Homeowners who had purchased appliances ten years before the actual remodeling, and ended up donating the appliances because they wouldn’t fit in the new kitchen. 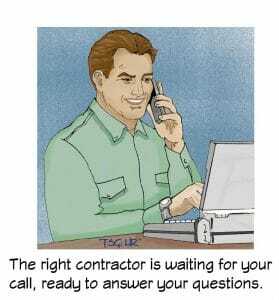 Your Contractor Is Waiting For Your Call! Your Contractor Wants You To Find Him/Her! The best way to find your contractor is referrals — from neighbors, friends, family, or business associates. These are your best resources, especially people who’ve remodeled recently. You can also get referrals from the showrooms you’ve visited. Don’t rely on advertisements. They can be misleading. You’ll be better off to contact your local professional remodeling organizations (NAHB, NARI, or NKBA) for several names and phone numbers. Most local building departments will not refer contractors. It’s a conflict of interest. Don’t hire a one-person contractor who says he/she does everything. An unforeseen family emergency, illness or injury can ruin time projections. There aren’t enough hours in the day for a general contractor to draw plans, manufacture cabinets, and work on your project. Overall quality of your project will suffer. The right professional designer knows where to find the products that reflect your personal taste, products that are compatible with your home. He or she can help you fit each product into your budget priorities. Designers like this do make a difference. How do you find the right designer for your project? 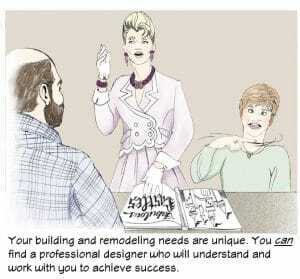 The best way to find a professional designer is referrals from family, business associates, friends, and neighbors. The next best way is through professional organizations such as NAHB, NARI, IDS, or NKBA. There may also be local design organizations, or local chapters of the national organizations that you can find in an internet search. Tell them the type of remodeling project you want, and they will provide names and contact information for up to three professional designers. 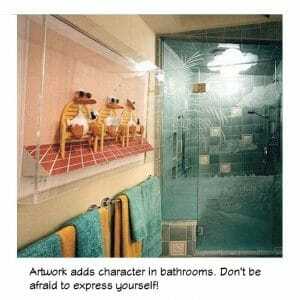 Express Yourself With Bathroom Artwork! If you’re remodeling your home, or just freshening up, don’t overlook bathroom artwork! It doesn’t have to be an expensive original, but art can establish or complete a theme. It can be a personal expression of something you care about. Or it can be simply art for art’s sake: the colors and textures that complement, contrast, or add the pizzazz you want. If you’re unsure about what art to use in the bathroom, it’s important to determine first who will see it. If it’s the master bathroom that only you will see, you can choose anything. But if it’s a bathroom that others will see, it’s best to err on the side of “politically correct,” unless you desire to start a conversation.